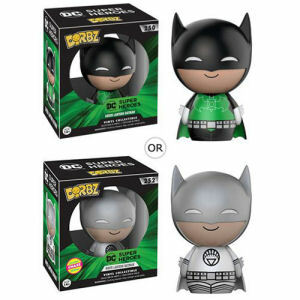 We have Just Sold out of DC Super Heroes Green Lantern Batman Dorbz Vinyl Figure. Not to Worry! Fill in the Notify me When Available and you will be the first in line for our restock of DC Super Heroes Green Lantern Batman Dorbz Vinyl Figure !! From the Batman Dorbz collection by Funko. DC Super Heroes Green Lantern Batman Dorbz Vinyl Figure.This item may have variants randomly inserted throughout the production run. We cannot accept requests for specific items nor can we accept returns on opened items. Dorbz Vinyl figures come in a double window-box package to fully display the character from both front and back. Figure measures about 3 inches tall.